One of the first things you learn as a new parent is not to give your baby baby aspirin. Why they call it baby aspirin is beyond me. It seems the name should have been changed when the link to Reyes syndrome was discovered. Instead of baby aspirin, parents have turned to acetaminophen products, like Tylenol, to bring down fevers and relieve pain. Unfortunately, this over the counter medicine may be the cause of an increase in childhood asthma. The asthma epidemic accelerated in the 1980s, some researchers have noted, about the same time that aspirin was linked to Reye’s syndrome in children. Doctors stopped giving aspirin to children with fevers, opting instead for acetaminophen. In a paper published in The Annals of Allergy and Asthma Immunology in 1998, Dr. Arthur Varner, then a fellow in the immunology training program at the University of Wisconsin School of Medicine, argued that the switch to acetaminophen might have fueled the increase in asthma. Since then, more than 20 studies have produced results in support of his theory, including a large analysis of data on more than 200,000 children that found an increased risk of asthma among children who had taken acetaminophen. 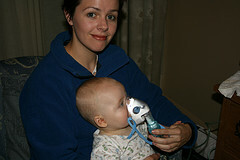 In November, Dr. John T. McBride, a pediatrician at Akron Children’s Hospital in Ohio, published a paper in the journal Pediatrics arguing that the evidence for a link between acetaminophen and asthma is now strong enough for doctors to recommend that infants and children who have asthma (or are at risk for the disease) avoid acetaminophen. I have had only one asthma attack, and it was induced from forest fire smoke. As a parent, I can’t imagine the constant worry and stress of dealing with this disease, let alone how scary it must be for the child. I have several friends whose children do suffer from asthma. Hospitalization and emergency room visits are the norm. As with any of the diseases we see increasing in children, I believe there is probably more than one culprit. We have reported in the past that traffic pollution and chlorine are also to blame. Fever is an abnormally high increase of body temperature in response to pathogen invasion. Body temperature is regulated by a section of the brain called thehypothalamus (hyper link-Nervous system) . Normal temperature is set by the hypothalamus at 37°C (98.6°F). If pathogens should enter the body, then macrophages, which would be fighting the invaders, secret chemicals called pyrogens. These chemicals order the hypothalamus to raise the body temperature; therefore, the body works harder to meet the set temperature. This means that there will be an increase in cell division. Not only does an increase in temperature kill many bacteria that can’t live in temperature over 37°C, but the immune cells divide and work faster to kill the pathogens. Fever can help fight infection, but sometimes it can climb too high for the body’s own good. Internal body temperatures in excess of 105 degrees F, for instance, expose proteins and body fats to direct temperature stressors. This form of heat distress can threaten the integrity and function of proteins accustomed to the body’s usual temperature variations and the occasional less excessive fevers. Cellular stress, infarctions, necrosis, seizures and delirium are among the potential consequences of prolonged, severe fevers. Always follow your doctor’s advice; however, I do think that parents probably overuse acetaminophen. We hate to see our children suffer. his clothes is causing that bad of a reaction then the exhaust of cars next to the building should do even worse. ..and god forbid you ever go anyplace with a woodstove or fireplace. . . If you are that sensitive to fragrances then perfumes, candles, etc would also be horrible. needs to use all natural products with no scents and nobody can wear perfume or hair gel, etc. ..and that you will be wearing a filter mask outside because of car exhausts, pollution, etc. I really wouldn’t try to complain if I were you. Second hand smoke (unless you are in an enclosed non-ventilated space while someone is actually smoking) is an easy scapegoat..but in reality it is much less irritating and damaging then pollution, car exhaust, fragrances, candles, woodsmoke, etc to asthma. Obviously if he were smoking in the office with you then you might have a justified complaint..or in a car with you, etc…but the fact that he is smoking outside on his break, is not something you have the right to complain about the smell on his clothes, asthma is not something you get to use as an excuse. You have the responsibility to get your asthma under control or to make changes yourself because of your asthma..others do not have the responsibility to make changes for or because of you..unless they chose to do so.. . If your asthma is that out of control you should be on sick leave, talk to your doctor about disability.